Home » Proof for a Moon Conspiracy? I’ve been distracted by Government contract nonsense so apologies if it’s been a while since my last post. Thankfully I’ve only got a few more days left to run on it before I get to enjoy what’s left of the British Summer – which I hope will turn into an ‘Indian Summer’ too if you get my drift! Anyhow, in a slight departure from the usual UFO/UAP material, I notice that the Syfy channel are planning a special documentary about a Moon conspiracy theory that may (or may not) rattle a few cages if the evidence presented in it is compelling enough. For further details have a look at the Open Minds article about this. In short, proponents of this theory suggest that the Moon has been inhabited by extraterrestrials for a (very) long time and that these aliens have established ‘bases’ on the Moon, which continues to be used as a staging point for visits by ET to Earth.There is apparently photographic evidence of artificial constructs on the Moon (on it’s far side of course, often incorrectly referred to as its ‘dark side’ – which we can’t see from Earth) and testimony by some ‘specialists’ in the space industry which supports this. This theory is not new and most likely was first given life shortly after the original Moon landing in 1969. A key story that probably kick-started this is that of the interception of restricted radio transmissions between the Apollo Astronauts and Mission Control which suggested that the astronauts were not only being ‘watched’ but effectively ‘warned off’ by the intimidating presence of several very large ‘spaceships’ hovering near their landing site. Further material has since come to light including photographs and witness testimony – all of which is practically impossible to confirm as genuine. Like the UFO phenomenon, this Moon theory has been dogged by ridicule and hoaxers over the years but – unlike supposedly Earth or sky-bound UFOs – it could be argued to be far harder to prove or debunk. This is because history currently tells us that only 12 human beings have actually set foot on the Moon (out of a total of 24 involved in the missions). This is provided you assume that they did, given there are also conspiracy theorists who would debate this as well – but that’s another story in itself! And – given our current known level of technology, most of us are not going to be seeing the surface of the Moon for ourselves anytime soon, so the theory still sits in that grey area of being ‘unproven’. However, I’ve listed a few key arguments for and against the theory below that might give those largely unfamiliar with the whole subject food for thought. 1. NASA who ran the Apollo program [sic] from 1961 to 1972, categorically deny ever having found any artifacts or evidence of an ET presence on the Moon. 2. None of the Apollo astronauts have gone on record as stating that they encountered any ET presence on the Moon. 3. 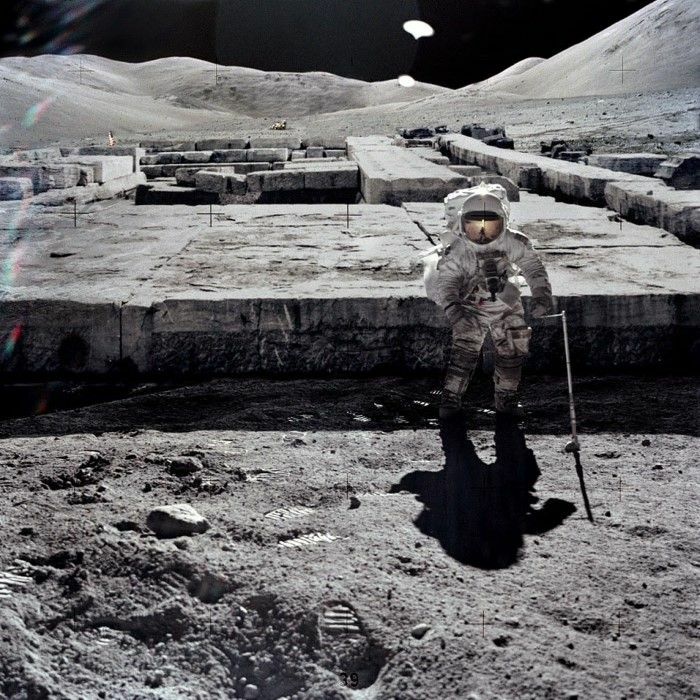 All photos of the Moon released by NASA and other space missions show no evidence of any alien presence on the Moon. Also thanks to modern satellite imaging technology and NASA archived images, the whole of Moon’s surface including the far side or ‘dark side’, has effectively been photographed and mapped and can be viewed by anyone online. No artificial structures or objects are visible on the Moon’s surface, other than the remnants of the Apollo Moon landings themselves. 4. It’s been 45 years since the first Moon landing and no hard evidence has come to light in all that time. 1. NASA may not in fact be revealing everything they discovered during the Moon landings. It certainly wouldn’t be the first time in history a quasi-official agency had deliberately withheld what could be highly sensitive information from the public. 2. If the previous point is true then the Apollo astronauts themselves could be sworn to secrecy with severe penalties for going public with any sensitive information. It’s been suggested that various ‘clandestine agencies’ other than NASA were also closely involved in some if not all the Apollo missions. Moreover, proponents of the theory have suggested that NASA and these ‘other agencies’ already had a good idea of what they’d find prior to the first mission. 3. Again if the previous two points are true then any ‘controversial’ photos of the Moon could have been re-touched or simply not released into the public domain. Additionally there could be a strict control or clearance on the release of any Moon imagery by NASA and the ‘other agencies’. This however would suggest, to be in anyway effective, a monumental effort by NASA and the other agencies and a heavy reliance on international cooperation i.e. with China and Russia and other countries with space technology. 4. The 45 years since the first Moon landing could be a moot point if the previous three points are true and there has been a concerted effort to conceal certain evidence from the public because of it’s extreme sensitivity and supposedly very high security classification. By way of a comparison, details of many highly classified secrets from the Second World War (e.g. the work of the Bletchley Park Enigma code-breakers and the Manhattan Project to create the first atomic bomb) have only come to light in subsequent decades and in some cases are only just being revealed now. As a footnote – it’s probably worth being aware of the little known Clementine mission which took place in 1994 and was a joint operation between NASA and the military to take high definition images of the whole of the Moon’s surface. The unmanned spacecraft was called ‘Clementine’ as it only carried enough fuel to complete its mission before being “lost and gone forever” as in the song “My darling Clementine”. This mission supposedly took 1.8 million images of the Moon but – to date – apparently only 170,000 of these have been put in the public domain. This begs the question “why?” if there is nothing worth seeing in the mass of unreleased images. On a separate note – and in keeping with my previous references to the slightly bizarre inclusion of ‘UFO crash drills’ at schools over the last few years – a recent project involving a giant ‘alien egg’ at the Holy Trinity Primary School in Halstead, Essex backfired a bit scaring some of the pupils. Have a look at the Daily Mail article for details. I couldn’t help a smile at the name of the fictitious National Museum of Strange Objects representative – Dr Violet Strangeways….